The Webvolution Designs Atlanta Web Design Company recently launched a brand new website for RotoAce.com, a website dedicated to Fantasy Baseball News, Rankings & Analysis. 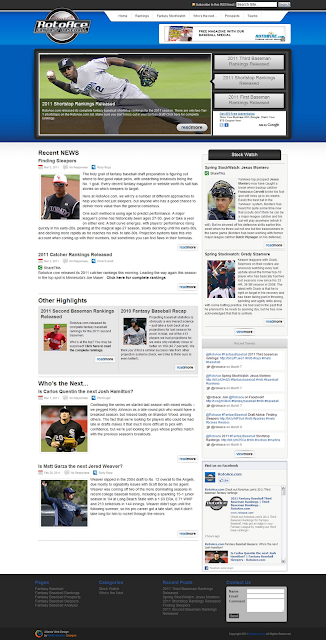 The new Fantasy Baseball News website is a content-rich, custom Wordpress CMS development that provides RotoAce.com an excellent framework for easy on-going content maintenance for its fantasy baseball analysis and projections. The homepage of the new Fantasy Baseball Rankings website has a slide show of RotoAce.com's top 3 featured blog posts and also highlights RotoAce.com's daily Fantasy player StockWatch and “Who's the Next” - a column discussing potential Fantasy Baseball Sleepers. The new RotoAce.com has custom Wordpress CMS functionality built in to dynamically pull in blog posts on pages assigned a specific blog category. The website also incorporates space for Google Adsense advertisements, a section of RotoAce.com's recent tweets and Facebook posts. Webvolution also provided logo design services for RotoAce.com. For more information on RotoAce.com, visit http://www.rotoace.com or email mail@rotoace.com. For more information about our Atlanta Web Design Company, contact Webvolution at (404) 953-2406. I have already used RotoAce.com's projections and tiers in my last fantasy baseball draft with much success! Thanks guys!